Some Mud - A few muddy spots, with a few more in the less traveled mid section. This is an excellent quality hard packed trail. If you are planning a through run, starting at the south end is preferable. That way, you get the hardest climbing out of the way at the beginning and you avoid the potential crowds in the arboretum and around Pittock Mansion on nicer days. For support, plan on caches at 53rd (mile 9) and Germantown Rd (Mile 24.5). Parking at the beginning is in a pay lot right at the Vietnam War Memorial or for free just up the hill by the arboretum. The Wildwood Trail, designated by the Secretary of the Interior as a National Recreation Trail, meanders for ~30 breathtaking miles, from the southern end of the trail at the Vietnam Veterans Memorial in Washington Park to the Northwest terminus of the trail at Newberry Road. There are blue diamond markers every quarter mile for the length of the trail. For much of its duration, the Wildwood Trail overlooks the Willamette River as it stretches onward, through the northeast slope of the Tualatin Mountains between NW Skyline Boulevard and NW St. Helens Road. 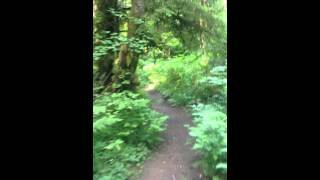 This trail provides for a quiet and serene run through varied and evolving forest ecosystem. The Wildwood enters Forest Park proper when it crosses West Burnside St. at about mile 3. In the spring, hillsides sparkle with trilliums amidst the sword ferns; hundreds of other kinds of flowers and shrubs bloom during the year. Forest Park itself plays host to hundreds of mammalian species: more than 100 kinds of birds have been seen in the Park! Fog in the trees along Wildwood. Easy stroll through towering trees!